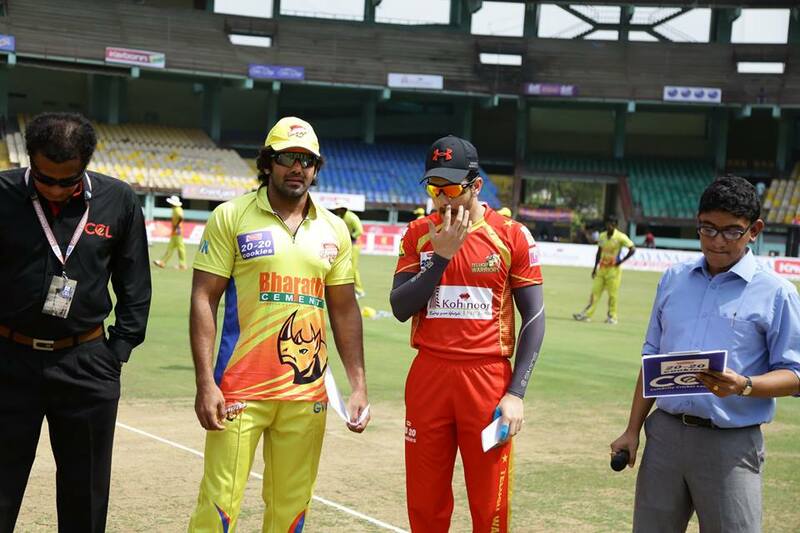 Telugu Warriors vs Chennai Rhinos live streaming scores ball by ball today match live cricket commentary available. TW Vs CR CCL T10 live cricket scores Celebrity Cricket League 2017 T10 Blast live online. The last match of Celebrity Cricket League 2017 before final is scheduled to be played between Chennai Rhinos and Telugu Warriors. Chennai Rhinos Squad: Aarya (c), Vishnu, Vikranth, Ramana, Raju Padmanabhan, Narendra Prasad, Abdullah, Kalayarasan, Hemachandran, Mahendran, Prithivi Rajan, Shanthnu, Ashok Chandran, Saran Kumar, Sanjay, Bharath, Bose Venkat, Shaam, Uday Kumar. Telugu Warriors Squad: Akhil Akkineni (c), Sachin Joshi, Vishwa, Prince, Sushanth, Khayyum, Harish, Sudheer Babu, Ashwin Babu, Dharam, Aadarsh, Nanda Kishore, Nikhil, Raghu, Samrat Reddy, Taraka Ratna, Tarun. Another tough competition is ahead between the defending champion of Celebrity Cricket League, and the Chennai Rhinos is also two times winner of celebrity cricket league and this is what makes the match more intense and tough for both the teams. On the counter side, this is the only chance for both teams as the loser will be out of event and winner will directly enter in the final match. This is the last of Celebrity Cricket League and 2nd last match of today’ session is scheduled to be played between Telugu Warriors and Chennai Rhinos and fans would be able to watch the most entertaining game so far. Telugu Warriors is looking forward to this match, while Chennai Rhinos is also going to acquire an aggressive attitude on the behalf of their previous game’ result against Bengal Tigers. On the counter side, Telugu Warriors are also in confident attitude as they met a side that did well in favor of Telugu Warriors.